This is a project I did using the Maya Road Treasure box. I painted the entire box white, Versamarked it, and then heat embossed it with Holographic embossing powder. 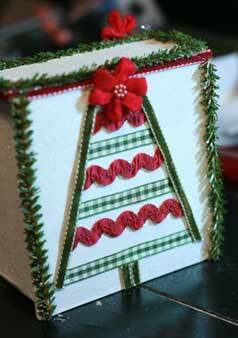 I then trimmed the edges with Maya Road ribbon and sequins and also with evergreen looking pipe cleaners. I created a tree on the backside of the box using Maya Road ribbons. 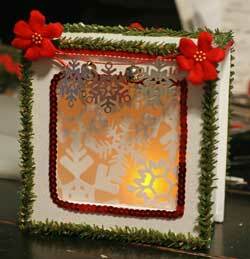 To "illuminate" the box I added a battery operated candle and placed it inside. 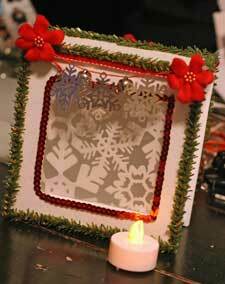 I also filled the "window" part of the box with a piece of snowflake die-cut paper from Little Yellow Bicycle. Now I have a safe and fun way to create a holiday mood! The reverse side of the box decorated with a xmas tree.